The “Roseanne” spin-off, “The Conners,” premieres on ABC on Tuesday. ABC exec Andy Kubitz told Vulture that the show will be “the number one new show for the season” if even half of the “Roseanne” audience tunes in. “Roseanne” was the biggest show of the year, and still had over 10 million viewers by its finale in May before it was canceled. ABC’s “Roseanne” reboot was short-lived, but the controversy surrounding it doesn’t mean a death sentence for its spin-off, “The Conners,” which premieres Tuesday. “Roseanne” is the biggest show of the year. 18.2 million viewers tuned in to its two-episode, hour-long premiere in March. By its finale in May, viewership had dipped, but it still reeled in over 10 million viewers for its final episode and had 23.2 million average viewers for the whole season, according to Nielsen ratings. The only other sitcoms that can compete are CBS’ “The Big Bang Theory” and its spin-off “Young Sheldon.” The former had 18.7 million average viewers, while the latter had 16.5 million average viewers. By comparison, even NBC’s hit “Will & Grace” revival – the fourth most popular sitcom of the 2017-18 season – only averaged 5.5 million viewers in its first season, which concluded earlier this year. But “Roseanne” was cancelled in May after star Roseanne Barr tweeted a racist remark at former Obama adviser Valerie Jarrett, comparing her to an ape. So when the Conner family returns this week, it will be without its former lead. That doesn’t seem to ruin the show, though. “The Conners” currently has a 93% Rotten Tomatoes critic score, and critics have said that Barr’s absence actually elevates the show. “Given everything it went through to become its own series, ‘The Conners’ makes a solid case for itself by trusting its cast to sell the hell out of a particularly tricky situation,”Variety’s Caroline Framke wrote. 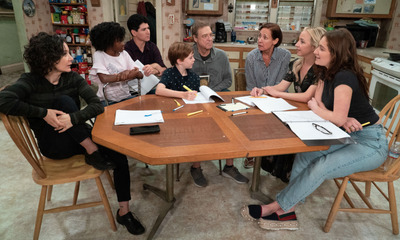 Time will tell whether “The Conners” will attract the audience that “Roseanne” did, or even half. “The Conners” premieres Tuesday at 8 p.m. on ABC.